See our contract (when booking) for complete terms and conditions. Certain minimum requirements vary depending upon the event date selected. All prices and packages are subject to change without notice. Family or Buffet Style Dinner (3 Entrees)................................... $ 27.75 .................... $ 39.00 Buffet Style Dinner (2 Entrees).................................................... $ 26.75 .................... $ 38.00 (Choice of 1, or 2 with 3 Entree Selection) • Roast Beef with Au jus, Demi-Glace or Gravy • Italian Beef Au jus with Peppers & Onion (add 35¢) • London Broil with Mushroom Bordelaise Sauce (add $3.10) • Thin Sliced Prime Rib of Beef with Au jus or Peppercorn Demi-Glace (add $4.25 - Subject to Market Price) • Roast Turkey Breast with Gravy • Deep Fried Chicken (Bone-In) (add 50¢) • Seasoned Baked Chicken (Bone-In): Lemon Pepper, Rotisserie, Rosemary Citrus, Italian Herbs or BBQ Spice • Boneless Breast of Chicken with Sauce (add $1.95) • Roast Loin of Pork with Gravy • Baked Ham with Honey Glaze • Meatballs with: Burgundy Gravy, Stroganoff, Marinara, BBQ Sauce, or Sweet & Sour • Herb Encrusted Pork Medallions • BBQ Sauced Pulled Pork (add 30¢) • Italian Sausage Wedges with Peppers & Onions in Marinara • Polish Sausage Wedges with Sauerkraut • Grilled Salmon Fillet with Bourbon Caramelized Onion or Champagne Sauce (add $2.75) • Vegetarian Filet - Seasoned Grilled Portabella Mushroom, Zucchini, Yellow Squash, Red & Green Pepper, & Red Onion (add $2.25) Side Entrees also available; Please see our attached menu for more options! Atmosphere/Decor: Remodeled in 2013. A spacious environment featuring two intricately carved solid oak bars with art deco mirror accents. Modern terazzo flooring offers an unlimited dance floor. 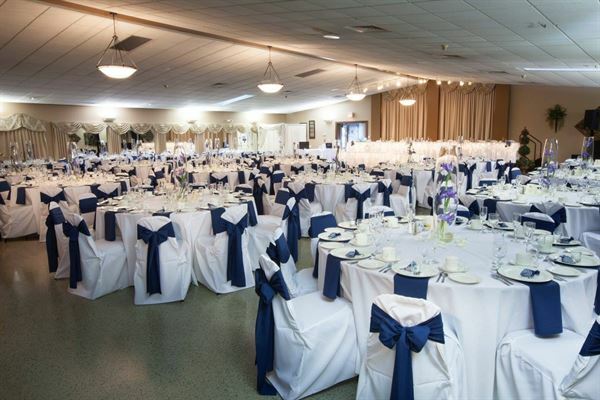 Beautiful custom draperies & brand new decor add to the elegant style. Special Features: Raised Stage can accommodate up to 12 people at a head table. 2 Tiered or a Longer Head Table is available too.